After the 5 stars and the Bangalore streets and sit-in Iftars, I had to try a couple of Combo Packs. 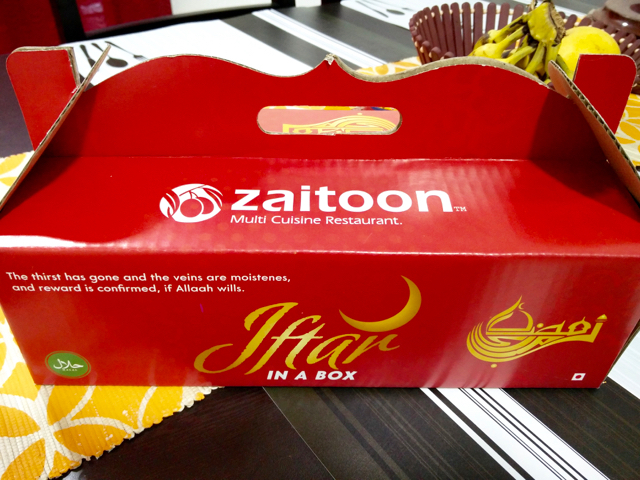 At the first opportunity, my first choice was Zaitoon when I was stuck home-alone for Iftar! 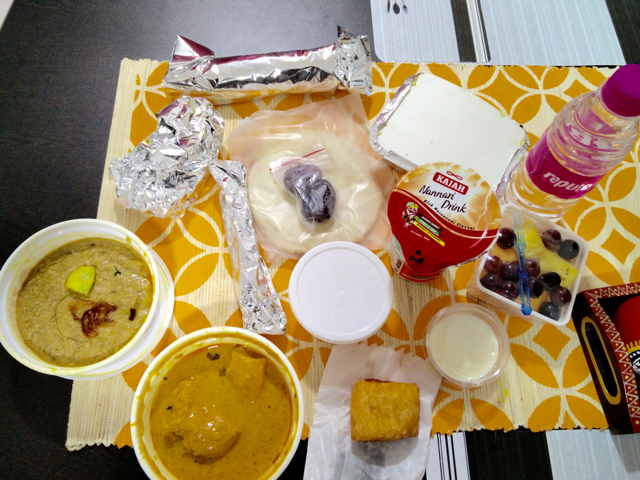 First impressions: Beautifully packed in a nice hard box and the food was arranged well enough that it didn't shake or spill inside. Perfect! Now for a box priced at Rs 299 for 300 things inside, you shouldn't complain at all. I mean, it is like a birth right to complain has been taken off! 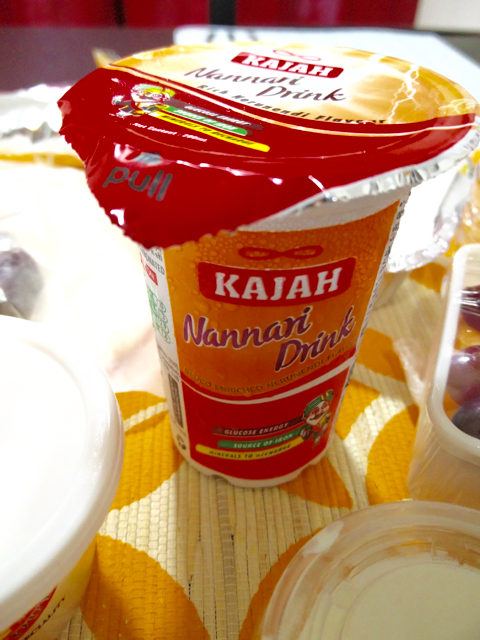 Nannari Drink tasted funny. Like a little too strong nannari syrup inside kind of funny, but after a couple of sips, it simply went inside post the 14 hour fasting stomach. Spoilt for choice over what to eat first, I devoured the haleem. 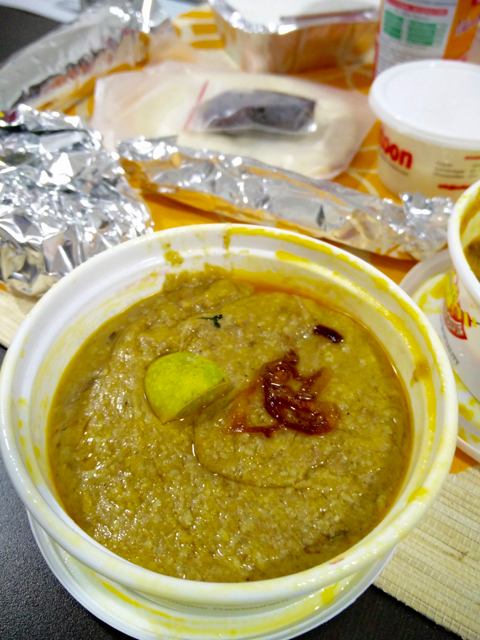 It was a little spicy for my liking, but the flavours were all there and wasn't some careless haleem. It was nice and boneless except for one teeny weeny bit of bone. At this price, no complaints! Tiny puff like thing. 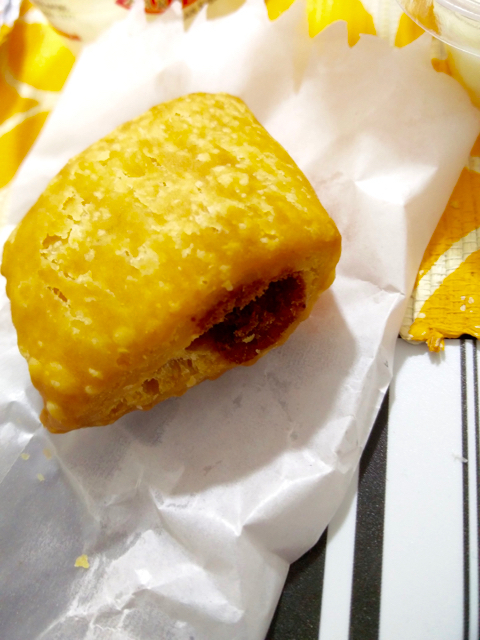 It was like a cross between a samosa and a Lukhmi. Bite sized and perfect. This was followed by the Khubus and the yummy grilled chicken. It was a nice decent sized piece and not some set of bones thrown in. Along with the given Toum (the garlic mayo like paste), it was enough to break fast with! Post prayers, I devoured the small paratha with a quite yummy chicken gravy, almost like a butter chicken, but with less butter! This was followed by the mini shawarma during Master Chef Australia and the dates. Yes, I had dates in the end! The only complete disaster was the rice. I don't know if this batch was bad or it is always like this in the Iftar pack, the rice was kind of over cooked and I couldn't take more than a spoonful. But at Rs. 299, I got more value that what I paid for. It wasn't too heavy and it can happily be a complete Iftar or if you have things at home, then one box can be a good accompaniment for two people.